The academic world has come to place enormous weight on bibliometric measures to assess the value of scientific publications. Our paper has two major goals. First, we discuss the limits of numerical assessment tools as applied to computer science publications. Second, we give guidelines on how to write a good paper, where to submit the manuscript, and how to deal with the reviewing process. 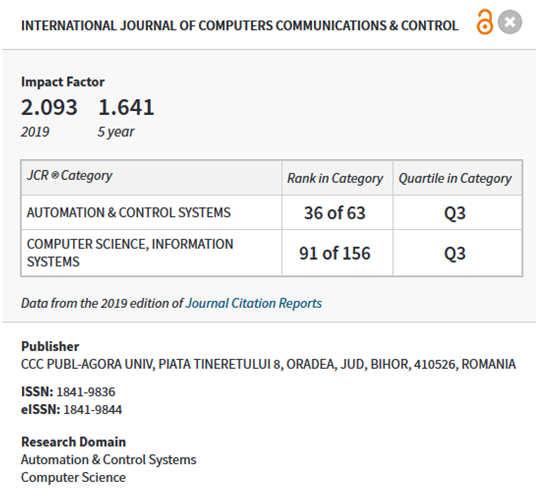 We report our experience as editors of International Journal of Computers Communications & Control (IJCCC). We analyze two important aspects of publishing: plagiarism and peer reviewing. As an example, we discuss the promotion assessment criteria used in the Romanian academic system. We express openly our concerns about how our work is evaluated, especially by the existent bibliometric products. Our conclusion is that we should combine bibliometric measures with human interpretation. M. Del Favero and N. J. Bray, "Herding cats and big dogs: Tensions in the faculty-administrator relationship," in Higher Education: Handbook of Theory and Research, J. C. Smart, Ed. Springer, 2010, vol. 25, pp. 477–541. ISBN 978-90-481-8597-9 (print), 978-90-481-8598-6 (electronic), DOI: 10.1007/978-90-481-8598-6-13. D. Patterson, L. Snyder, and J. Ullman, "Best practices Memo: Evaluating computer scientists and engineers for promotion and tenure," Computer Research Association, 1999. C. E. Glassick, M. T. Huber, and G. I. Maeroff, Scholarship Assessed: Evaluation of the Professoriate. Jossey-Bass, 1997. M. Y. Vardi, "Conferences vs. journals in computing research," Commun. ACM, vol. 52, no. 5, pp. 5–5, 2009, ISSN: 0001-0782. R. A. Day, How To Write & Publish a Scientific Paper. Oryx Press, 1998. J. Swales, Genre Analysis: English in Academic and Research Settings. Cambridge University Press, 1990, ISBN-10: 0521338131; ISBN-13: 978-0521338134. M. M. Polycarpou, "Editorial: A new era for the IEEE Transactions on Neural Networks," Neural Networks, IEEE Transactions on, vol. 19, no. 1, pp. 1–2, January 2008, ISSN 1045-9227. S. Neelakantan, "In India, plagiarism is on the rise," GlobalPost, pp. 142–143, October, 18th, 2009. A. J. Smith, "The task of the referee," IEEE Computer, vol. 23, pp. 65–71, 1990. A. Wilcox, "Rise and fall of the Thomson impact factor," Epidemiology, vol. 19, pp. 373–374, 2008, ISSN: 1044-3983. Online ISSN: 1531-5487.